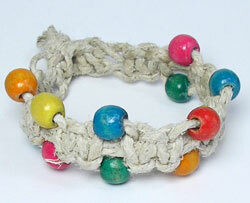 This hemp bracelet pattern is fun to make, super easy, and super quick. The brightly colored beads remind me of gumballs, hence the name. The secret to the chunky look is the thick hemp twine I used (40 lb. test). Who Is This Bracelet Project For? This bracelet is a fun starter project to introduce macrame to older children, ages 8 and up, and a fun one for adults too. 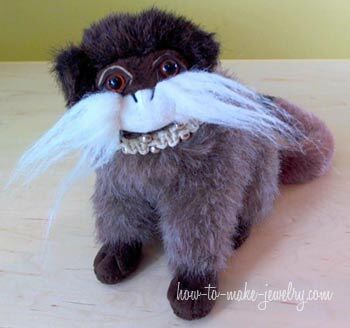 Have a child with an aversion to crafts? The bubblegum bracelet makes a great choker necklace for small stuffed animals. Try enticing them with that. Cut your 9 feet of 2mm hemp twine into 2 lengths. The first length cut at 7 feet. You should be left with a second length of 2 feet. Fold your 2 foot length in half and secure to a clipboard. Your 7 foot length will be your working strands. Using the shorter piece as your anchor strands, start by making a sliding switch knot clasp. 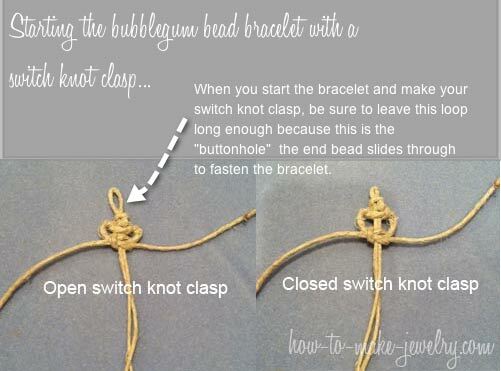 Next, make 1 square knot then string a wooden bead onto each of your knotters. A knotter is a strand that is used for knotting, as opposed to an anchor strand which you knot around). Learn more hemp and macrame terms. Make 2 square knots, string a wooden bead onto each of the two outer strands. Basically you are repeating what you see in the picture above. Repeat the pattern (2 square knots, add 2 beads) until your bracelet is long enough to go around your wrist. Make 1 switch knot then 1 square knot. To make a switch knot, you leave a gap then make a square knot. The pictures below are my attempt at showing you what I mean. If the pictures don't make sense, check out my detailed instructions for making a switch knot. Using all 4 cords, make an overhand knot below your last square knot. The overhand knot will be the 2nd half of your clasp (the part you slide through your loop. Trim the twine and dab some glue onto the knot and the cut ends (prevents fraying and keeps the knot tight). Let dry. First slip the closure knot through the loop. Make sure the sliding knot is pushed down from the end so that you have a loop showing. Next, push the sliding knot of the clasp up towards the closure knot. The closure knot is now securely closed. To get the bracelet off, just slide the knot back again and slip the closure knot out. 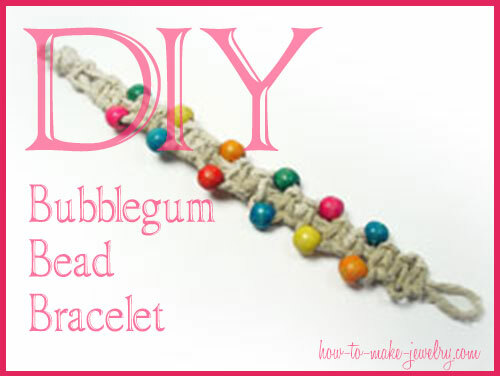 Of course, you can also glam up this Bubblegum Bead Hemp Bracelet too. It doesn't have to be hemp. That's what I love about this hemp bracelet pattern. It's so simple, yet still versatile. You can use a nice silk cord and jade beads for an oriental look, or colored hemp and metal beads for 21 st century flower child style. Use your imagination and see what you can come up with.